I am sure you know a lot of things about Russia, You know its Prime Minister/Judo teacher, The great Churches and Palaces of Moscow… But did you know about those four Items Russians created at some point in History? Here’s a List of 3+1 Tsar Stuff or in other words Huge Stuff created by Russians. 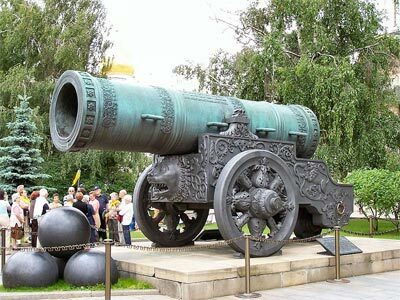 Tsar Pushka (Russian: Царь-пушка, literally “Tsar-cannon”) is a huge cannon, commissioned in 1586 by Russian Tsar Feodor and cast by Andrey Chokhov. The cannon weighs nearly 38 metric tonnes and has a length of 5.34 meters (17.5 feet), a calibre of 890 mm (35 inches), and an external diameter of 1200 mm (41 inches). The Guinness Book of Records lists it as the largest howitzer ever made. The Tsar Bell (Russian: Царь–колокол, Tsar-kolokol, “Tsar bell”) is a huge bell on display on the grounds of the Moscow Kremlin. The bell was commissioned by Empress Anna, niece of Peter the Great. 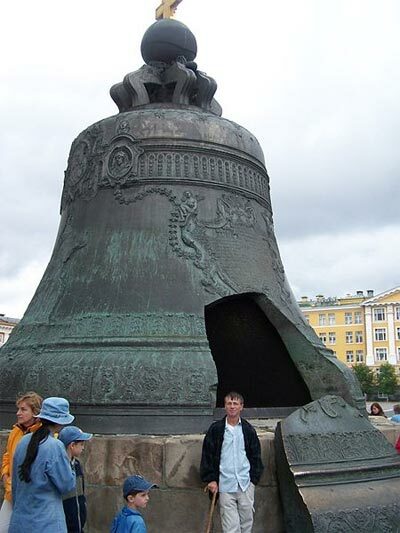 The bell is currently the largest bell in the world, weighing 216 tons, with a height of 6.14 m and diameter of 6.6 m. It was founded from bronze by masters Ivan Motorin and his son Mikhail in 1733–1735. Ornaments, portraits, and inscriptions were made by V. Kobelev, P. Galkin, P. Kokhtev, P. Serebryakov and P. Lukovnikov. The bell was never rung — during a fire in 1737, a huge slab (11.5 tonnes) cracked off while it was still in the casting pit. For a time, the bell served as a chapel, with the broken area forming the door. There has apparently been some talk of recasting it. 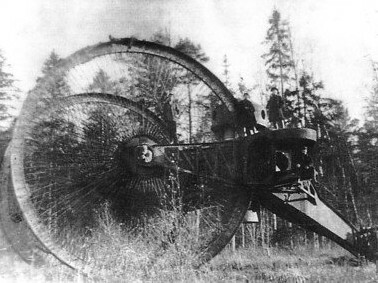 The Tsar Tank, also known as the Netopyr’ (Нетопырь, Pipistrellus bat) or Lebedenko Tank, was an unusual Russian armored vehicle developed in 1914–1915 by N.Lebedenko, Nikolai Zhukovsky, Boris Stechkin, and Alexander Mikulin. The project was scrapped after initial tests deemed the vehicle to be underpowered and vulnerable to artillery fire. The tank was different from modern tanks in that it didn’t use caterpillar tracks—rather, it used a tricycle design. The two front spoked wheels were nearly 9 metres (27 feet) in diameter; the back one was a smaller, only 1.5 metres (5 feet) high, triple wheel, to ensure maneuverability. The upper cannon turret reached nearly 8 metres high. The hull was 12 metres wide with two more cannon in the sponsons. Additional weapons were also planned under the belly. 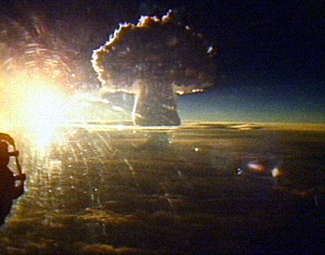 Tsar Bomba (Царь-бомба), literally “king Bomb”, is the Western name for the RDS-220 hydrogen bomb (codenamed “Иван” (Ivan) by its developers) — the largest, most powerful nuclear weapon ever detonated. Developed by the Soviet Union, the bomb was originally designed to have a yield of about 100 megatons of TNT; however that was reduced by half in order to limit the amount of nuclear fallout that would result. Two bombs were built, a mock bomb and the real bomb, with the real bomb being tested on October 30, 1961, in the Novaya Zemlya archipelago. Despite testing, the weapon never entered service; it was simply a demonstration of the capabilities of the Soviet Union’s military technology at that time. 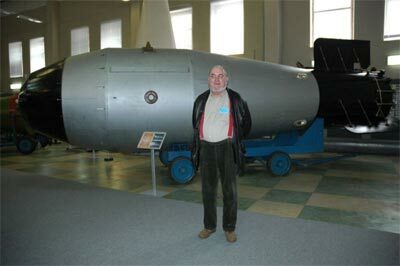 The mock bomb was stored in the Russian Nuclear Weapons Museum in Sarov.